With a sudden return of winter weather to our area, I found myself with some time to curl up and read. 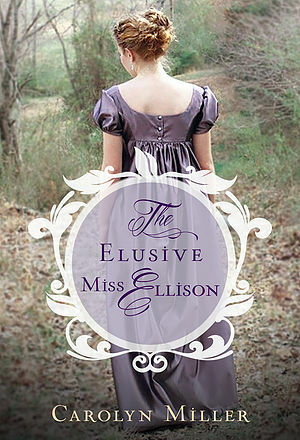 This time, the book of choice was The Elusive Miss Ellison by Carolyn Miller. This is the debut novel by Carolyn Miller and also the first in the Regency Brides A Legacy of Grace series. This piece of Regency Era fiction, set in 1813 was well written and has me looking forward to learning more about it's characters in the future books in the series. ...and it was as though that lack of focus and her intelligence were exactly what made her so attractive. Of course, there always has to be a foil to an easy boy meets girl story. In this case, it was of course the difference in their station - him an Earl and her merely the daughter of the reverend. I was not surprised at the change in environment when the Earl's mother arrived at his house and decided to invite over friends, whose daughters were a better match for the Earl in her mind. She definitely was not about to let her son fall for the daughter of the reverend and did her best to intervene. I was at first a little bit disappointed to learn about the family secret that was revealed to Liviana as she dealt with disappointment in herself and the loneliness that ensued. It felt like too neat of a turn at first, but the author did a great job using it to help unwind the story without allowing it to become a truth that made all the rest neatly fall in place. The story wrapped in a great fashion, almost in spite of the turn of the family secret, leaving me wanting for more. I guess the good news is that the next book in this series is set to be available this summer and I can continue to learn more about this set of characters from the Regency Era. If you enjoy period fiction, and more specifically Regency Era fiction, I would recommend this book to you. Learn more about the book and read additional reviews on the Blog Tour Landing Page.